I aspire to be a classical homeschooler. Many times we fall short, but my ultimate goal is to stick closely to the classical model and definitely include a study of Latin in our home. However, I delayed the start of our Latin studies in favor of learning Spanish. We lived in an area where Spanish speakers were in the majority. We had many opportunities to hear and practice our Spanish. I was already somewhat familiar with Spanish. Starting with Spanish seemed so much less intimidating for our first foreign language experience. I was able to find more resources and provide more help to my children as they learned Spanish. There are lots of CD’s, DVD’s, online resources, and books that teach Spanish. Our family was able to find friends and relatives who spoke Spanish so we could practice our language skills. This was fun to practice vocabulary and conversation in real-world situations. Learning Spanish helped lay a foundation for learning grammar concepts in another language. I found it easier to study grammar in a language in which I already understood the basics. Starting our language studies with a language that was not totally unfamiliar to me gave me the confidence to tackle Latin with the declensions, pronunciation, grammar, and tenses. Now that we moved on to our Latin studies in 4th grade I can see the multiple ways in which we benefitted from studying Spanish first. My kids have learned how to analyze another language, learning vocabulary and new grammar concepts. I’ve gained confidence in teaching a foreign language and feel more prepared to study a less familiar language. My kids have discovered the joy and excitement of learning another language and being able to communicate with others in that language. It benefitted us to study grammar in Spanish and then transfer our knowledge over to our Latin studies since Spanish and Latin are similar. 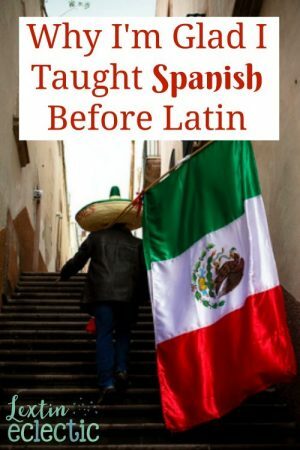 My kids were thrilled and amazed to see all the connections between Spanish and Latin and also between Latin and English. They loved tying all of their knowledge together as they saw similar words and word roots. Studying Spanish first made our subsequent study of Latin easier. Latin somehow felt more approachable and less intimidating to all of us. I’m glad I started our language study with Spanish and then moved into Latin. And now we can continue both languages at our own pace. I plan to continue both Spanish and Latin through middle school and into high school. LOVE THIS. We live in a large Spanish speaking area as well and I've already started teaching my kids (ages 4 and 2) some Spanish. Hi, Lexi! My husband and I are also second generation homeschoolers! Right now we have triplets (all girls) in K5 and a two-year-old son. My background is in ASL interpreting, so my kids are already learning ASL first. I do want to do Spanish as well (I also have a decent background there) before moving on to Latin and then possibly another language if they have a passion for something else before graduating. My question for you is, at what age did you begin teaching them Spanish? And what resources would you recommend as your favorite? I started using Song School Spanish in Kindergarten and 1st grade. It is fun with songs and a cute DVD. I actually do it in K and repeat it in 1st grade. My kids also love watching Salsa Spanish from Georgia Public Broadcasting. I’m thinking about trying the Fun Spanish from Brookdale for 2nd grade. In 3rd grade we use Getting Started with Spanish. It’s very easy to use. There are lots of other great elementary level Spanish programs that are fun and colorful. I’ve found it most challenging to find Spanish for middle schoolers – especially programs that don’t require a teacher who is fluent. Hopefully that helps you get started!